Learn the names of the different dog breeds that comprise a "pit bull," the selective breeding history of the pit bull (dogfighting) and answers to other frequently asked questions. Q: What is a pit bull? Q: What is the history of the pit bull? Q: What is dogfighting and why are pit bulls connected to it? Q: Why do I always read about pit bulls in the news? Q: Why do people say that pit bulls "don't let go?" Q: Do pit bulls bite more than other dog breeds? Q: Can a pit bull be correctly identified? Q: Why do pit bull owners say, "My dog might lick you to death?" Q: Why do people say, "Pit bulls are dog-aggressive not human-aggressive?" Q: What is the best thing we can do for communities and pit bulls? American pit bull terrier, American Staffordshire terrier, Staffordshire bull terrier and American bulldog. The legal definition of a pit bull is a class of dogs that includes several breeds: American pit bull terrier, American Staffordshire terrier, Staffordshire bull terrier and any other pure bred or mixed breed dog that is a combination of these dogs. Progressive legislation also includes the American bulldog,1 a related breed that shares the same blood sport heritage of bull baiting. In 1999, the United Kennel Club became the only major kennel club that recognizes the American bulldog. Pit bulls are the dog of choice amongst dogmen, individuals who fight their pit bulls against other pit bulls. Dogmen consider pit bull terriers, who they commonly call "100% bulldogs," to be the ultimate canine gladiator. Pit bulls were selectively bred for "gameness," the ability to finish a fight. A truly gamedog will continue fighting "on stumps," two or more broken legs, and far worse.6 (Please see excerpts from The Complete Gamedog, by Ed and Chris Faron to learn more). The blood sport of dogfighting involves a contest between two dogs, primarily pit bulls, fighting each other in front of spectators for entertainment and gambling purposes. Other felonious activities, such as illegal drugs, often accompany dogfight matches. A single dogfight averages about an hour in length but can last two or more.7 A dogfight begins when a referee says, "Face your dogs," then says, "Let go." The fight ends when one of the dogs will not or cannot continue. When a pit bull attacks, the injury inflicted may be catastrophic. First responders, such as police officers and firefighters, understand this as do members of the media, who are quick to report these attacks. Ongoing social tension also keeps pit bulls in the news. The pit bull problem is now over 30-years old.11 In this time, most lawmakers have been "too afraid" to take breed-specific action to correct the problem. Due to this failure, horrific maulings continue to make headlines. Leading pit bull education websites, such as Pit Bull Rescue Central, encourage pit bull owners to be responsible and to always carry a "break stick" -- a tool used to pry open a pit bull's jaws -- in case their dog "accidentally" gets into a fight. These same websites also warn that using a break stick on any other dog breed may cause serious injury to the person.15 This is true because no other dog breed possesses the pit bull's tenacity combined with a "hold and shake" bite style. Depending upon the community in which you live and the ratio of pit bulls within it, yes and no. But whether a pit bull bites more or less than another dog breed is not the point. The issue is the acute damage a pit bull inflicts when it does choose to bite. The pit bull's "hold and shake" bite style causes severe bone and muscle damage, often inflicting permanent and disfiguring injuries. Moreover, once a pit bull starts an attack, firearm intervention may be the only way to stop it. Yes, pit bulls are an identifiable dog breed. This is validated by a series of appellate court decisions starting in 1988. 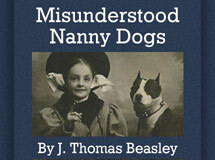 (For a breakdown of each decision see: Pit Bulls Are Identifiable). Each appellate court concluded in its own variance that a "dog owner of ordinary intelligence" or a "layman" could identify a pit bull. Pit bull owners and animal welfare groups, however, still claim the average person, and even professional shelter workers, cannot correctly identify a pit bull. Nowhere do the high courts make any presumption of "expert" knowledge being necessary to identify a pit bull. Further, appellate courts in Ohio explained in 1989 and 1991 that "an ordinary person could easily refer to a dictionary, a dog buyer's guide or any dog book for guidance and instruction" and "consistent and detailed descriptions of the pit bull dog may be found in canine guidebooks" and more.18 These rulings occurred a decade before the invention of Google Search. Garcia v. Village of Tijeras, 767 P. 2d 355 - NM: Court of Appeals 1988. Vanater v. Village of South Point, 717 F. Supp. 1236 - Dist. Court, SD Ohio 1989. Colorado Dog Fanciers v. Denver, 820 P. 2d 644 - Colo: Supreme Court 1991. Ohio v. Anderson, 57 Ohio St. 3d 168 - Ohio: Supreme Court 1991. 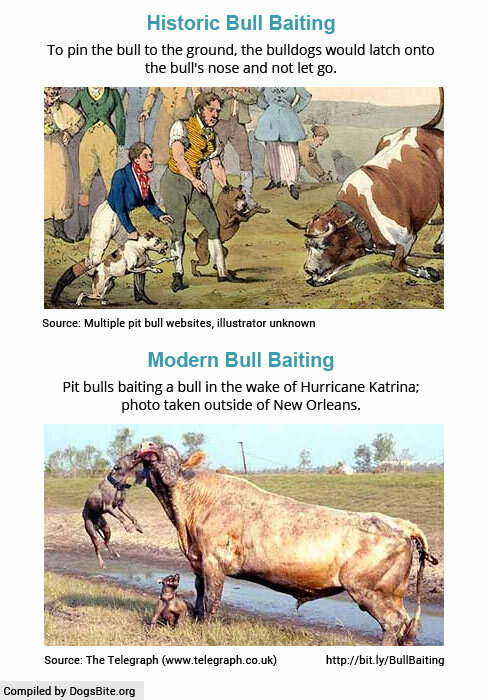 Learn more by taking our Pit Bull Identification Quiz in Myth #2 of the Pit Bull Myths section. Due to selective breeding for the purposes of dogfighting, pit bulls are highly dog-aggressive. This aggression is not limited to dogs; pit bulls frequently kill other companion pets and domesticated animals. Leading pit bull education websites warn pit bull owners to, "Never trust your pit bull not to fight." These same websites also state that pit bulls should never be left alone with another dog or animal.20 The practical and moral question is: Why is "pit bull dog aggression" tolerated at all? Pit bull dog aggression is unacceptable for two reasons. In many instances it leads to human aggression. A common scenario is the following: A loose pit bull attacks a leashed dog being walked by its owner. The owner gets seriously injured trying to stop the attack. Every year, one or more Americans suffers death due to pit bull dog aggression, including pit bull rescuers like Rita Woodard and Mary Jo Hunt who died while attempting to break up a fight between their pit bulls. Secondly, far too many beloved companion pets and domesticated animals suffer a violent death by the powerful jaws of pit bull terriers each year. In some instances, these attacks involve pit bulls charging through screen doors of private homes -- in a home invasion attack -- to kill the pet living inside.21 Owners of the pet are then forced to watch as their dog or cat is disemboweled by the pit bull and pray that the animal does not turn its attention on an innocent family member next. Learn more about human-aggressive pit bulls in Myth #3 of the Pit Bull Myths section. Over 900 U.S. cities and nearly all privatized military housing -- the U.S. Army, U.S. Marine Corps and U.S. Air Force -- and many public housing authorities have breed-specific restrictions. Such measures often include: mandatory sterilization, liability insurance and strict containment rules. The most progressive law, a pit bull ban, prohibits new pit bulls and new pit bull breeding. In just a few years, these communities see a significant drop in pit bull bites and euthanasia of pit bulls. Jurisdictions, particularly in Ohio and nearby states, are also incorporating canary dogs (presa canarios) into their breed-specific dog ordinances. See the Wheeling, West Virginia example. From 1987 to 2012, Ohio had a statewide pit bull law. This document references the statute at that time, Section 955 of the Ohio Revised Code. By 2006, "a breed of dog commonly known as a pit bull" included: American pit bull terrier, American Staffordshire terrier, Staffordshire bull terrier, American bulldog and any other pure bred or mixed breed dog whose appearance and physical characteristics is predominately those of any of the dogs listed above, or is a combination of any of the dogs listed above. Though the state law was repealed in 2012, many jurisdictions in Ohio maintain their pit bull ordinances. The appellate decisions pertaining to this issue remain intact. American Pit Bull Terrier Handbook, by Joe Stahlkuppe, Barron's Educational Series, Inc., 2000. Also see the rules governing recognized dog fight matches: The American Pit Bull Terrier (History of Fighting Dogs Series), by Joseph L. Colby, The News Publishing Company, 1936. The Complete Gamedog: A Guide to Breeding & Raising the American pit bull terrier, by Ed and Chris Faron, Walsworth Pub. Co., 1995. Combined data from: Mid Year Results: U.S. Pit Bull Attacks 2009 and Mid Year Results: U.S. Police and Citizen Shootings of Pit Bulls 2009, by DogsBite.org, August 2009. One City's Experience, by Kory A. Nelson, Senior City Attorney for the City of Denver, Municipal Lawyer, July/August 2005. See also: Pit Bull Case Report and Literature Review, by Steven F. Vegas, MD, Jason H. Calhoun, MD, M. Eng., John Mader, MD, Texas Medicine Vol. 84, November 1988. Information provided by the Lucas County, Ohio Dog Warden and viewing the "Gray's pit bulls" (April 11, 1997) video. Vanater v. Village of South Point, 717 F. Supp. 1236 - Dist. Court, SD Ohio 1989. Ohio v. Anderson, 57 Ohio St. 3d 168 - Ohio: Supreme Court 1991.